Is it possible that education is the issue that will determine whether results of the upcoming election swing the United States Senate to Republican Party control? Will there be a dramatic change in party control of state governors’ offices because of how candidates stand on supporting pubic schools? As the November contests approach, these are valid questions, according to keen observers and a confluence of new polling data. Education, often thought of as an also-run issue in the political arena, is top of mind to voters approaching the November contests. Both anecdotal information and empirical data drawn from surveys confirm that voters don’t just value public education; they want candidates who will support classroom teachers and oppose funding cuts to public schools. The evidence is strong that Democrats can make support for public education a winning issue – if they’re willing to take the advice. Democrats looking to score points with the voting public should talk up public education. At least that’s the conclusion that can be drawn from new survey data from pollster Celinda Lake. The poll was conducted by Lake Research Partners and the Tarrance Group from August 24th – August 28th, among 1,000 likely 2014 voters, with a margin of error +/- 3.1%. The first conclusion Lake drew from her findings is hardly surprising: “Voters are pessimistic about their personal financial situation.” The vast majority of Americans feel their own personal economic situations have gotten worse (36 percent) or stayed the same (35 percent) over the past four years. Other non-surprises are that voters are preoccupied with the economy and the ineffectiveness of their government, and they are increasingly concerned about immigration. Democrats desperately need to turn out the vote from the “rising American electorate” that includes unmarried women, African Americans and Latinos, and voters under 30. These voters want a government that does something to reduce the gap between the rich and everyone else and addresses the problems of the middle class. But these voters are also notoriously difficult to turn out in mid-term elections. These voters are concerned that a Republican Senate would restrict women’s reproductive health (58 percent), cut access to health care (58 percent), deny equal pay to women (57 percent), and cut funding for Head Start and K-12 education (57 percent). But what are the positive messages that will get these Democratic Party voters to turn out? But 2014 may be different. Republicans keep cutting education and attacking public schools, hurting our ability to compete economically and taking away opportunities for our children. Republicans proposed cutting billions in public education, including programs like Head Start, to pay for tax cuts for the wealthy. That hurts our children, as good teachers leave, class sizes increase, art and music programs disappear, and schools become less safe. Families are struggling, paying for basic supplies, and seeing their schools decline. Those priorities are just wrong. 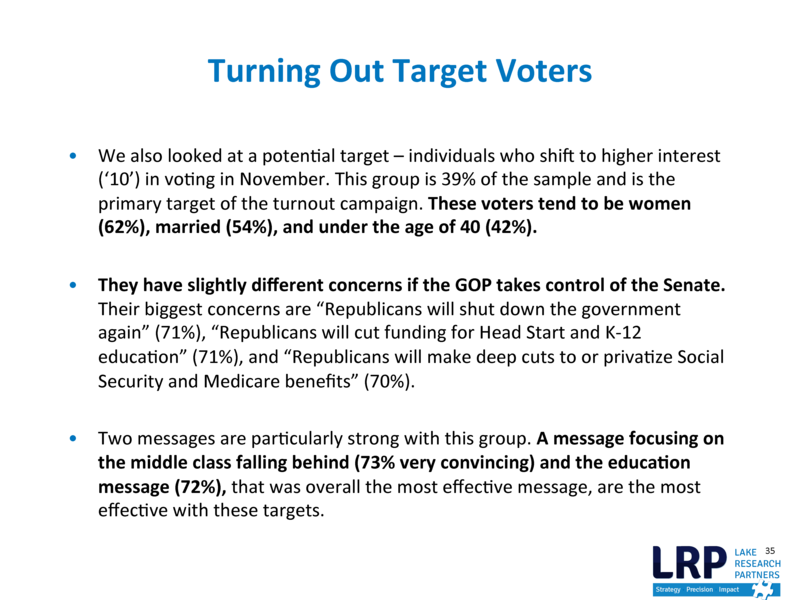 Lake’s work also examined more closely a potential target of “individuals who shift to higher interest (’10’) in voting in November.” This group is a significant part of the sample (39 percent), which tends to be women (62 percent), married (54 percent), and under the age of 40 (42 percent). These voters are particularly moved by education messaging. They are concerned that a GOP takeover of the Senate would result in Republicans shutting down the government again (71 percent) and cutting funding for Head Start and K-12 education (71 percent). The discovery that Americans are highly supportive of public schools is nothing new. Recent polling results from the annual PDK/Gallup Poll of the Public’s Attitudes Towards the Public Schools show that Americans overwhelmingly support their public schools and respect classroom teachers. That survey also found that a majority of Americans do not support current public education initiatives – such as new standards and teacher evaluations based on test scores – that most political candidates are touting as “reform.” When asked what they think are the biggest problems that public schools in their community deal with, Americans of all political persuasions cite “lack of financial support” number one. This strong support for public schools is having an impact on upcoming elections. As an experienced education journalist at Education Week recently observed, education is top issue in most important senate races in November. The results of many of the gubernatorial races around the country also hinge on education. In Georgia, education funding and the role of charter schools in the state’s system have come to the fore in the contest between incumbent Republican Nathan Deal and Democratic challenger Jason Carter, a state senator and grandson of former President Jimmy Carter. In Kansas, widespread voter anger over school closures and funding cuts have imperiled the reelection of Republican Governor Sam Brownback. In Florida, Republican incumbent Rick Scott’s support for new Common Core standards and his cuts in education spending have put him in hot water with a range of voters, from conservative Tea Party activists, to Independents, and Democratic Party voters alike. In Pennsylvania, voters rank education as the most important issue, and current Republican Governor Tom Corbett has been rated “the most vulnerable governor in America” due in part to his support for severe cuts to education funding. Whether Democrats can overcome the staggering odds against them this election remains to be seen. But one thing is clear: Democratic candidates in these contests and others need to make support for public education front-and-center of their campaigns.